NHS Ayrshire & Arran is the first area NHS board in Scotland to endorse Scotland’s Charter for a Tobacco-free Generation. The Charter for a Tobacco-free Generation is a new initiative from health charity Action on Smoking and Health (ASH) Scotland in response to the Scottish Government’s goal of creating a tobacco-free generation of Scots by 2034. The Charter has six key principles that encourage organisations to examine how they can best contribute to the tobacco-free goal. NHS Ayrshire & Arran is joining a list of national organisations which have already backed the Charter including Children 1st, British Lung Foundation, British Heart Foundation, Aberlour Childcare Trust, and the Scottish Cot Death Trust. NHS Ayrshire & Arran’s endorsement of the Charter is the latest in a series of actions taken to help reduce the harm caused by tobacco. In March 2015, all NHS Ayrshire & Arran’s grounds went smoke-free, and they have also supported other public and private sector organisations in Ayrshire and Arran to move to smoke free grounds. Currently, patients who smoke and have to stay in hospital are visited by a Fresh Air-shire advisor. These specially trained advisors are able to assist patients in managing their smoking while they are in hospital. This may involve being prescribed Nicotine Replacement Therapy (NRT) for abstinence while in the hospital, or being given further NRT, advice and support to stop smoking after the patient is discharged from hospital. Fresh Air-shire, NHS Ayrshire & Arran’s smoking cessation team, also provide support for people in local communities. Regular drop-in clinics are held throughout Ayrshire, making it easier for people to get help and support to quit. A telephone support helpline is also available. 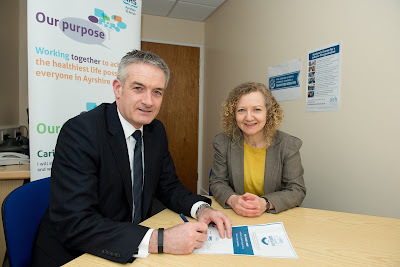 NHS Ayrshire & Arran chief executive John Burns said: “We fully support the key Charter principles which aim to create a tobacco-free generation of Scots by 2034. “Our Fresh Air-shire team work in nurseries, schools, further education, workplaces, GP practices, prisons, hospitals and community venues to offer support and advice in relation to all aspects of tobacco control, that is, prevention, cessation and protection. Every day in Scotland, 40 young people become new smokers, which equates to 15,000 young people each year. Evidence shows that the younger a person starts to smoke, the more likely they are to continue smoking into adulthood, the more heavily they are likely to smoke as an adult and the more likely they are to fall ill and die early as a result of smoking. Preventing or delaying children from taking up smoking has been shown to reduce the burden of disease in later life and make it more likely that they will not smoke. One in three (34 per cent) adults in the 20 per cent most deprived areas in Scotland smoke cigarettes.